Tyrion finds Sansa up on the Stark Watching Wall and we have reunion number two. They speak awkwardly about how they were married that one time and then Sansa throws down another truth bomb: Cersei is a lying liar who lies and whatever she told him, there is a zero percent chance she’s sending the Lannister Army to help out, and Tyrion is a fool to believe her. Sansa is one hundred percent right about Cersei and Tyrion is starting to realize she is just as right about him. Then at the Godswood we get the reunion we’ve been waiting six seasons for: Arya and Jon embrace, talk about swords, and argue about Daenerys versus Sansa. Jon’s sad no one likes his new girlfriend, and sadder that Arya backs Sansa. 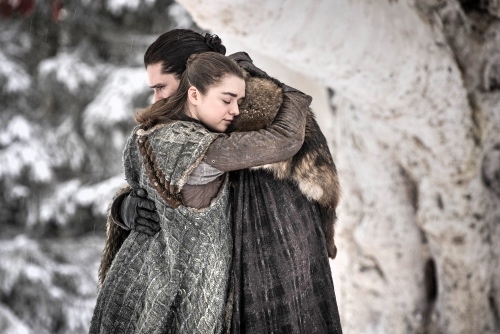 Now that Sansa, Bran, and Arya are all back in Winterfell, Jon appears haunted by old demons that he’s not really a Stark and his closest ally agreeing with the sister she never got along with hurts that much more. Arya isn’t turning against Jon, of course, she’s just realized Sansa is the smart one. I must say I quite like “[Sansa]’s the smartest person I’ve ever met” following right after “I used to think you were the smartest person in the world.” It’s not just Stark pride, though it is absolutely Stark pride. It’s Sansa and Arya being entirely over men telling them what smart is. While Euron is off with his Queen, Theon sneaks onto his ship to finally save Yara. She knocks him down for abandoning her and helps him back up because they’re family. That’s the reason Euron told her he’d kept her alive, but Euron murdered his brother. 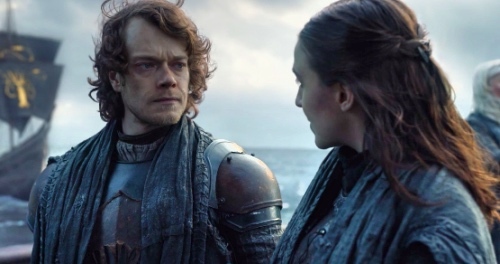 Euron and Cersei (and Tywin and Balon) talk about family but Yara and Theon (and all the Starks) understand what it really is. Yara loves her brother at his worst. Back in Winterfell Tyrion, Varys, and Davos are conspiring to marry off Jon and Daenerys in order to secure the North’s allegiance. So anyone who thought that would happen: it will definitely not. Meanwhile, Daenerys and Jon are commiserating about how little respect Sansa has for them. Jon is sorta nostalgic about it and Daenerys is imperious. 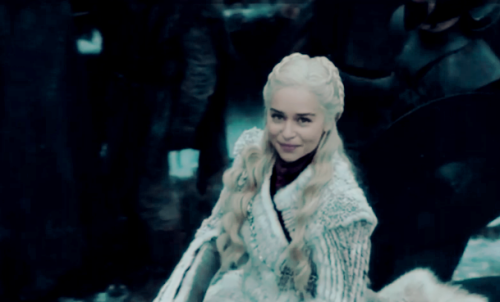 Maybe Jon was going to talk her down from her high horse, but instead two dothraki interrupt with the news that the dragons are hungry and Daenerys cares more about her babies than literally anything so they run off to check on them. At which point we get the long awaited scene of Jon Snow riding the dragon named after his dad and it’s lovely. I could hear the How to Train Your Dragon soundtrack the whole time they were flying (apologies to Ramin Djawadi , I’m sure the dragon flying theme is great but I really love that trilogy). They land in a frozen meadow by a waterfall to consummate their forbidden love and now I can hear Anakin and Padmé’s love theme (apologies again, but “Across the Stars” is literally my favorite song in the world). 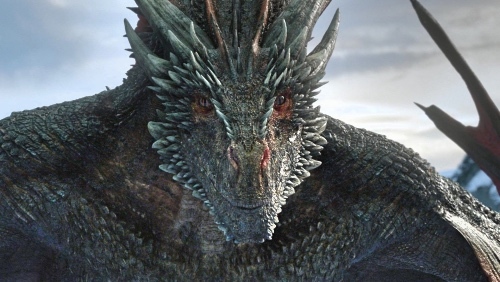 Rhaegal stares at Jon in that way that says ‘I love my cousin’ aka just like Bran. Time for two more reunions: Arya and the Hound spit and snark at each other – he whines that she left him for dead, she reminds him she stole his stuff first, exactly like he taught her to, and Arya wins that round – and then Arya and Gendry flirt adorably. He straight up says “As you wish” which any proper fantasy fan knows translates to “I love you” and they are either endgame or will die tragically (or both, I guess). While I still think King Gendry and Queen/Hand Arya is a boring end, these two kids deserve happiness. Sansa greets Jon with the news that Glover’s decided to sit out the latest Stark Boi war. Jon sighs a long suffering sigh and whines that he never wanted to be King in the North anyway. It’s a kind of poetry that Jon has the very best claim to the Iron Throne and the very least interest in claiming it. Sansa is Tired of Your Whining™ and once again bluntly asks the question that needs asking: why did he bend the knee? Because from where she’s sitting it’s another case of the puppy love that ended up killing the last Stark Boi King in the North. This is both a bigger and a smaller scene than I expected. 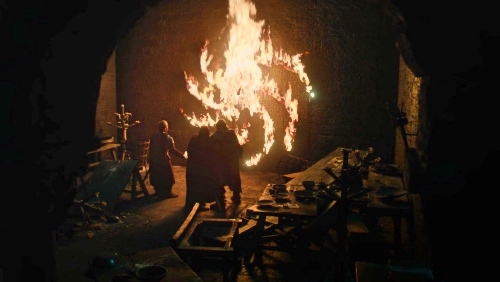 In any other season this reveal would have taken a lot more time, and I’m grateful it did not, it’s far smarter for Daenerys to own up to this straight off. 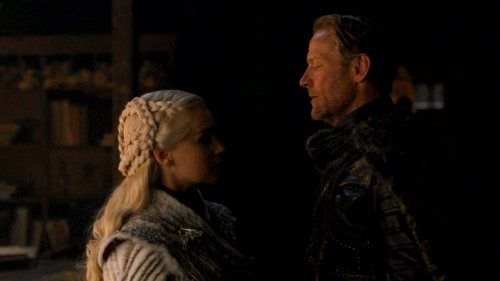 Sam’s reaction is expected, and entirely reasonable, but Jorah ends the scene still fully in his Khaleesi’s corner, which if not unexpected, is interesting. Finally, back in Winterfell a lonely soldier in a hood makes his way through the gate. Jaime Lannister looks around, clearly sad and tired, and finds Bran Stark waiting to welcome him. 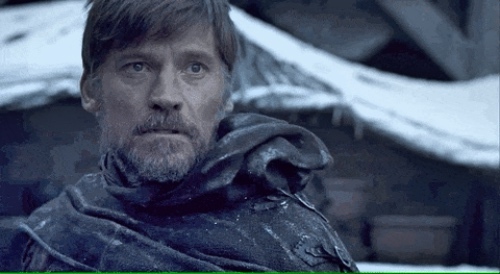 Way back in the very first episode of the series Jaime pushed Bran out a window to keep his transgressions secret and now Bran is keeper of allllllll the secrets: If you strike me down, I shall become more powerful than you can possibly imagine. So that’s another theme of the episode/season: the past is catching up with everyone. This episode is set up for the battle(s) to come but it has a lot of character moments, and even humor for all that, and is a solid start to the season.